We provide comprehensive multidisciplinary care for patients with Parkinson’s and support for their families and caregivers. Although there is currently no cure for Parkinson’s disease (PD), multidisciplinary medical care interventions can help people with Parkinson’s lead fulfilling and productive lives for many years while also decreasing the physical and emotional burden of PD. 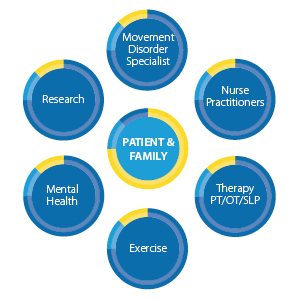 In our interdisciplinary approach, patients are always the central focus, with patients and their caregivers accessing services as needed at any point in the progression of the disease. Patients and families have easy access to ongoing information concerning services and benefits. A nurse coordinator assists in accessing services and maintaining open communication. Using our state-of-the-art telehealth technology, Dr. Ray Dorsey from the University of Rochester, and Dr. Tsao-Wei Lang from Thomas Jefferson University, both experts in movement disorders, bring advanced, specialized care to the people in our state who have PD. Dr. Dorsey, Dr. Lang and Prof. Roseanne Dobkin, an expert in psychology at Rutgers-Robert Wood Johnson Medical School, work closely with UD Nurse Practitioners, clinical specialists, physical and speech therapists, exercise physiologists, nutritionists, researchers, and local mental health professionals to meet the needs of our patients. Scientific research is an integral component of The Parkinson’s clinic. The research studies in the clinic are designed to help us better understand various aspects of Parkinson’s disease and to advance treatment and therapeutic modalities. As a patient in the clinic, you are not required to participate in any research study, but we will inform you about research opportunities for which you are eligible if you would like to participate. Call the NMPCC at 302-831-3195 to make an appointment. The staff will answer any questions and schedule your appointment. Prior to your first appointment, you will receive a package containing forms and questionnaires to be completed before your appointment. 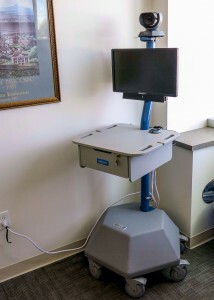 Your first appointment will take approximately 2 hours – the first hour with the Nurse Practitioner on-site and the second hour with either Dr. Dorsey or Dr. Lang via telehealth connection. Your follow-up appointments will be scheduled as indicated based on the evaluation of your physician and the Nurse Practitioner. The Parkinson’s Clinic at UD’s Star Campus is developing solutions for people who suffer from the disease. When the Beach Boys sang about good vibrations, this wasn’t what they had in mind, but it does come pretty close. Researchers at the University of Delaware STAR Campus have created a vibrating shoe that helps patients with Parkinson’s disease. Where did the idea come from? UD Parkinson’s Clinic director Ingrid Pretzer-Aboff has been working on creating new methods for Parkinson’s care with her team. One of her colleagues, Dr. Madhuri Behari, hosted some of UD’s studies at her lab at New Delhi’s All India Institutes of Medical Sciences. Study participants mentioned that they were walking better in the lab than they were outside the lab. The study team tried to figure out why, and they narrowed it down to patients who were taking the train. Read more.